His surname is Bernardone. His first name should have been John but his father who was used to trading with France, and maybe because his mother came of Provencal origin, his father preferred him to be called Francis. 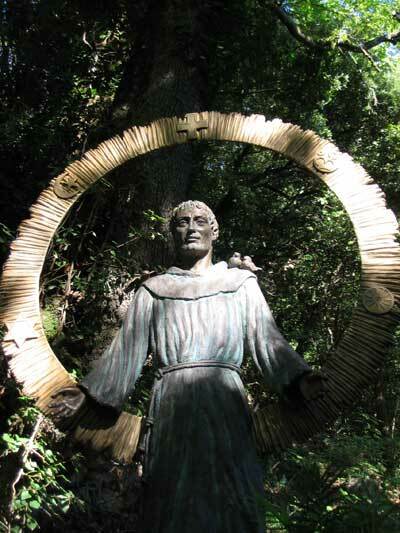 As he was born in Assisi, he is called Francis of Assisi. He was born in 1181 (or 1182). He knew a fulfilled childhood, living well-off. Son of a rich merchant, he naturally prepared himself to succeed his father. And as he had much money he also had a lot of friends: he was the prince of the well-off youth in Assisi. But he dreamed to become a knight. His first experience was a real disaster: after a war against Pérouse, the neighbor town, he stayed in jail for one year! Then he fell ill. In spite of all that, he tried to dedicate himself to chivalry. But little by little he got the intuition that there was better to do. He first understood he had to repair the ruined churches: that’s what Jesus Christ revealed him on the Saint Damien crucifix, in 1205. He was 24. The following year, he broke off with his family and renounced to his goods. He nursed lepers and repaired chapels for two years. And in 1208 –at 27 years old- he discovered listening the gospel at mass that his vocation was to live from it to the letter. Very fast men came to join him. They went to Rome and asked the Pope his agreement for this new way of life in the Church. Granted reluctantly! And women adopted the same way of life: they were called “the Poor Women” then Clarisses, the name of the first of them, Clara. Laymen also asked to be allowed to live this way of evangelical life, keeping their family and job. It became the Third Order which complete the Franciscan Family. Brothers left for other European countries. Francis himself went to Egypt to convert the sultan. The two men parted with esteem for each other. It was in 1219. Then he gave up the direction of his order and retired to write a project of life, a rule for his brothers. In 1223, it was done, he received the Pope approval. He celebrated Christmas in Greccio where he realized the first living crib. More and more identified to Jesus who overcame him, he retired in the hills of Alverne: after praying a lot, in his body appeared marks of Jesus ‘Passion, stigmata. Suffering from his eyes, ill, almost blind, he took refuge in Saint Damien and composed the Canticle of Creatures and his Testament. And on October 3rd 1226, at the age of 45, he died. In 1228, he was proclaimed saint, canonized as we say, and the pope made a basilica build on his honor in Assisi. People of all over the world come and venerate Francis, poor and witness of the Gospel.